A lot has happened in Sino-Russian relations in 2014-2015, but some observers still are pondering whether this is a serious, alliance-like relationship with far-reaching impact on the Asia-Pacific region or something more ephemeral, subject to clashing regional interests that could turn the two against each other. Just two years ago a Special Forum assessed Sino-Russian relations in triangular contexts, but returning to this theme opens the way to evaluating the impact of closer bilateral ties and how they are impacting countries situated between China and Russia. In arms build-ups, states joining China and Russia in multilateralism, and states struggling to maneuver between then, the tighter bond between these two powers has had transformative implications. Rather than concentrate on the Sino-Russia-US strategic triangle, the articles here range across an arc from the Pacific Ocean to the Indian subcontinent. China and Russia have announced the drawing together of their respective plans for regional integration along with the strengthening of their bilateral relationship. The economic component of this relationship has encountered some hurdles, leaving the plans announced in 2014 and early 2015 delayed or subject to reconsideration. That puts more reliance on strategic relations, arms sales by Russia and geopolitical links in an arc from Japan to North Korea to Mongolia to Central Asia. In this set of articles, we survey triangular relations across the arc as well as recent bilateral arms sales. We extend coverage of the regional impact of Sino-Russian relations to late 2015. This introduction is abbreviated because the Open Forum of The Asan Forum 3, no. 5 carried an article introducing Asia’s Northern Tier along with its Southern Tier. We already have discussed what is meant by the tier of countries including China, Russia, North Korea, and Mongolia, i.e., the Northern Tier. Our commentary here is limited to brief highlights from the five articles that follow and some remarks about how they fit together. Each article apart from Paul Schwartz’s piece on arms relations covers one of the triangles that help us to understand how the Northern Tier is taking shape. The core of this tier is Sino-Russian relations, as they unfold and as they influence the neighboring countries that round out the prospects for a broader framework. It is the essential triangularity of this arena that preoccupies us in this Special Forum. The decision to concentrate on Sino-Russian relations and North Korea rather than South Korea or the peninsula as a whole warrants explanation. While Beijing and Moscow approach South Korea quite independently, they have long looked to one another as they have formulated policy toward North Korea or considered its future. It is impossible to comprehend their geopolitical policies toward Seoul without first grasping their reasoning about Pyongyang. Moreover, both Moscow and Beijing see Pyongyang, to some degree, as a challenge to their bilateral relations, reminiscent of their attentiveness to each other’s posture there during the Cold War. Economic ties to Seoul can proceed independently of each other, but security concerns are linked. Examination of the arms trade gets to the heart of the bilateral security relationship. Scrutiny of how bilateral relations are proceeding in Central Asia focuses on what has been perceived as the most difficult challenge related to spheres of influence. A similar challenge exists in the triangle with Mongolia, which has in the past perched under both Beijing’s and Moscow’s control. Whereas in the Cold War Central Asia was part of the Soviet Union and Mongolia was firmly under its yoke, North Korea managed to play Moscow off against Beijing, and now it continues to be a test for their relationship. Finally, our coverage turns to Japan—a US ally and not amenable to Sino-Soviet competition in the Cold War—, but a test case for whether relations can reach beyond traditional contested grounds to become the anchor of a bloc in opposition to the US-led bloc. Will Beijing and Moscow agree on a tough line versus Tokyo or will they diverge as one takes a hardline stance and the other beckons? In late 2015, agreement trumped divergence, as was the case across the northern arc. To those who doubt the strength of Sino-Russian relations, the recent boom in the arms trade poses a sharp rebuke. After a lull in arms sales to China, in April 2015, Russian officials announced that the two had concluded a major contract for the sale of S-400 air defense systems to China at an estimated price tag of USD 3 billion. Moreover, in November 2015, a new contract was announced for the transfer of 24 Su-35 combat aircraft for an estimated price of USD 2 billion. These two high-profile items are far from the entire picture of arms transfers, plans for joint production, and joint military exercises. Paul Schwartz presents detail on these interactions and others in this upsurge in ties. Russia has concentrated its efforts on China, perceived to have both the wherewithal (economic and political power) and the willingness (as a long-time strategic partner) to provide the kind of support needed for Russia’s arms industry and geopolitical ambitions. To a significant extent, overtures to Beijing have paid off; China has stepped up support for Russia both diplomatically and economically. Russia and China have intensified their level of arms trade, increased the scale and frequency of joint military exercises, boosted collaboration between their respective defense industries, and conveyed an image of two closely aligned states. In fact, this process seems to be gaining momentum as the two have recently announced several new initiatives likely to lead to further cooperation in the military sphere. We will probably see an increase in the number of joint research and development programs to produce new military systems, Schwartz opines, adding that the closer integration between their respective defense industries poses one of the greatest potential dangers from their intensified defense cooperation. If such cooperation lasts for any real duration, the combination of Russian technology coupled with Chinese funding and industrial capacity could lead to developments that pose a formidable challenge. Schwartz explains how various weapons systems would benefit China. The Lada would be ideal for helping China to overcome the deficiencies in its conventional submarine fleet. While the new submarine would directly boost China’s undersea capabilities, its indigenous submarine programs would also benefit from access to the Lada’s sophisticated quieting technology as well as its advanced sensors and weapons systems. The Su-35 will provide an immediate boost for China’s air force while it awaits completion of the J-20. China is also interested in getting its hands on the Su-35’s advanced technology, especially its high performance Saturn 117S aircraft engines and its powerful Irbis-E radar system. The naval S-400 would significantly extend the reach of China’s ship-based air defense umbrella, enabling China’s fleet to operate at increasingly greater distances from shore and would help China’s fleet defend itself against emerging US threats. Schwartz concludes that the arms trade is likely to increase significantly over the next two to three years, as China takes advantage of Russia’s newfound willingness to transfer advanced military systems which it has previously withheld from China. Much has changed in two years: the Sino-Russian relationship is drawing closer, Vladimir Putin and Xi Jinping are both asserting their national leadership much more forcibly; Kim Jong-un’s thinking is coming unmistakably into focus; and the historical and national identity context is now more vividly in relief in light of the seventieth anniversary commemorations on May 9 in Moscow, on September 3 in Beijing, and on October 10 in Pyongyang. There is reason to look beyond today’s impasse of North Korea in diplomatic limbo, as it still looms as the biggest test of whether we will see Six-Party multilateral cooperation or regional polarization. To repeat the mantra of “five versus one” would make us complicit in neglecting and misunderstanding what China and Russia are trying to achieve on the peninsula and, via negotiations over North Korea, for their national interests and, no less, their national identity. In Chinese eyes, Seoul faces a zero-sum great power clash, and its ties to Pyongyang, as influenced by Beijing, depend on how it balances the two powers. Deterrence and trust building are at odds. China can help with the latter, but efforts to bolster the former that play into the US rebalancing will not win China’s support. China’s use of the word “stability” continues to give the wrong impression, making its aims seem quite modest, as if it were a status quo power, ignoring its demands on the United States and South Korea. On the meaning of peace and stability or the reinforcement of the Pyongyang regime, Moscow is close to Beijing in its posture, albeit with more support for the status quo in the regime and wariness about reform, which could play into Beijing’s strategy. It is no less obsessed with preventing a new “color revolution.” As long as unification is perceived as an ideological threat (one more “color revolution”); a historical travesty (reversing the outcome of 1945 if not the harmonious order prior to Western imperialism), a civilizational defeat (the Western approach to democracy and human rights would be boosted); and a loss of equilibrium in the regional balance of power (even a neutral Korea would not be trusted to remain so), China and Russia will agree on supporting North Korea. North Korea continues to serve as the principal test of the extent to which China and Russia can agree on regional security where it matters most for them. It is viewed through the prism of the US alliance system. It is seen as a barricade against the kind of extension of US power into traditional areas aligned with Beijing, Moscow, or both that has occurred in Central and Eastern Europe. Narrowing focusing on views of the desirability of denuclearization without clarifying its priority and the other goals also being sought confuses thinking about what China and Russia together are seeking. For over a decade, overlapping rhetoric has grown ever more conspicuous. This is the conclusion Rozman draws in his contribution to the Special Forum. Russians held out hope through much of 2014 and 2015 that relations with Japan as well as South Korea would be part of their “turn to the East” not their “divorce from the West.” They sought Abe’s as well as Park’s attendance at international galas in Moscow. They encouraged a warm tone about ongoing talks, but by the fall of 2016 the higher profile of Abe’s ties to Russia had given way to the more unabashed tone of insults from high-ranking officials, as aerial overflights and probes of Japan’s defenses continue without apparent letup to register Russia’s displeasure. Stephen Blank argues that Japan’s prolonged pursuit of Putin, even when Russian statements offered scant reason for optimism, only reinforced Russian views that Japan is significantly isolated regionally and needed talks more than Russia did. There was more insistence that Russia is not looking to Japan to balance China; only Japan has balancing China in mind, as Moscow seized on the atmosphere of Japanese anxieties over Sino-Russian relations to increase the pressure on Tokyo. From Russia’s actions—e.g., Russo-Chinese naval maneuvers that featured simulated amphibious landings, and Putin’s prominent presence at President Xi Jinping’s anti-Japan seventieth anniversary celebration of the end of World War II—, it should have been clear that no realistic prospect for normalizing Russo-Japanese relations exists. Blank asserts. This latest effort at normalization has apparently failed largely for two reasons. First, it became a casualty of Russia’s invasion of Ukraine and the international reaction to that aggression. Second, the reaction helped to intensify the Sino-Russian partnership and has driven Russia to ever-greater dependence on China, which comes at the expense of rapprochement with Japan. As Japan failed to remove sanctions and drew ever closer to the United States, Russia resorted to more hardline tactics. Yet, at the end of 2015, there is talk of Abe visiting Putin in Russia in the coming months to be followed by the oft-postponed visit of Putin to Japan, as if a territorial deal and peace treaty with attendant economic agreements remain within reach. It is early to conclude that the harsh tone of Russian remarks has put an end to Abe’s quest to be the Japanese prime minister who finally resolves this loose end from World War II. It appears doubtful, however, that his disregard of Japan as a force for multipolar Asian relations will be reconsidered by Putin as he continues to prioritize China. After boom times and a rather benign foreign policy environment, Mongolia has had to navigate a much more complicated foreign scene, characterized by a deepening conflict between Russia and the West and menacing tendencies in Sino-American and Sino-Japanese relations. Elbegdorj’s answer to these challenges has been to engage closer than ever before with Russia and China. Western observers have begun to question whether Mongolia still has the willingness or the ability to maintain its “third neighbor” policy. As Russia and China close ranks, Sergey Radchenko asks, will Mongolia toe the line drawn by its more powerful neighbors, or will it be able to continue exploiting existing contradictions between the two, which it has successfully done in the last twenty-five years? In the shadow of the Ukraine crisis, he finds, Mongolia could not afford to alienate its powerful northern neighbor: the country heavily relies on Russian imports, particularly energy. Mongolian policy elites concluded that Russia’s international isolation, and, in particular, anti-Russian sanctions imposed by the EU, the United States, and Japan, offered a potential opening to Mongolia for making significant economic gains. Whether Russia pivoted to the East or China to the West, Mongolia offered the shortest distance for Sino-Russian collaboration with the prospect of considerable windfall for a country in dire economic need. In view of Mongolia’s difficulties and hopes, it is not surprising that the country reacted as it did to Russia’s war in Ukraine and to annexation of Crimea. Even as Mongolia’s relations with Russia have improved, so have relations with China, both in terms of the multiplicity of the angles of engagement and the depth of political and economic cooperation. Xi’s visit to Mongolia inaugurated a new stage of the bilateral relationship, “a comprehensive strategic partnership.” Most important, however, was Xi’s assurance that China had a “positive and open attitude” towards Mongolia’s “steppe road” initiative. Elbegdorj hopes to catch the wind of China’s “One Road, One Belt” initiative even as Russia’s “pivot” to the East brings prospects of additional investment and economic cooperation. Radchenko cites this reasoning, but casts doubt on its effect. Mongolia’s closer engagement with its two neighbors, Russia and China, is not a strategic change of direction but a tactical move. It is based on the realization that, with Mongolia’s economy in increasingly dire straits, political engagement could bring increased economic benefits. Unfortunately, some of Elbegdorj’s calculations have clearly fallen far short of his initial expectations. The most worrisome development has been China’s economic slowdown. The key problem of the Sino-Russian rapprochement that was supposed to give such great impetus to Mongolia’s infrastructural development is that in economic terms it has generally failed to deliver. Mongolia’s resources are worth less and less, and its transport corridor leads to a dead-end – Russia. Mongolia’s successes or failures are largely defined by the fortunes of its neighbors, and both of its neighbors are feeling the heat, Russia, of course much more than China. Mongolia’s worsening economic situation amid ongoing political wrangling over investment projects makes for an explosive combination ahead of the parliamentary elections next spring. In this conclusion, Radchenko raises serious doubts that Mongolia’s strategy is working. Their differences have made the Shanghai Cooperation Organization (SCO) more valuable to China and Russia, since the organization provides an institutional framework to reassure them about each other’s overlapping activities in Central Asia. China values the SCO as a means to lesson Russian alarm about its expanding influence in Eurasia, e.g., it characterizes its bilateral loans and security exercises with Central Asian partners as occurring within the SCO framework rather than as bilateral Chinese initiatives. Yet, China has been making efforts to win soft power approval of Central Asians through regional economic and cultural ventures. Russia has now elevated the importance of consolidating economic ties with the region and seeks to incorporate these states into its vision of a single, shared economic space reminiscent of that of the Soviet Union. Russia currently holds a clear advantage over China with regard to its hard power military deployments and its soft power resources. The Chinese are willing to fund long-term infrastructure projects in Central Asia that the Russian government cannot afford and private Western companies typically eschew. Chinese authorities have refrained from leveraging these economic assets to gain military facilities in Central Asia, which Beijing clearly sees as falling within Moscow’s security sphere, a state of affairs that Chinese leaders prefer to continue. Thus, an accommodation has been working, which serves both Russia and China as well as Central Asian states. Overlapping interests in Central Asia that Russia and China can achieve without mutual conflict include: preventing transnational terrorism, drug trafficking, and other transnational threats; averting social revolutions and mass disorders in Central Asia; exploiting the region’s economic resources, especially oil and gas deposits and transportation conduits; and constraining the local elites from aligning with other extra-regional partners and limiting Western influence there and, conversely, inducing them to follow their diplomatic direction. This is the view of Richard Weitz, who finds cooperation prevailing over competition in late 2015. Weitz also finds that Russia has tried to sustain its military primacy in Central Asia without Chinese support and in the face of the Western military drawdown, but whether its armed forces, preoccupied with Syria and Ukraine, and its economy, weakened by depressed global commodity prices and Western sanctions, can generate sufficient capacity to sustain the region’s security in the face of potentially rising transnational threats is unknown. The degree of actual Sino-Russian cooperation to counter Western influence and even Central Asian terrorism is unclear but probably not great. They likely share some intelligence about terrorist threats, while participating in various joint exercises in Central Asia that occur under the auspices of the SCO. These are some limits to Sino-Russian cooperation. 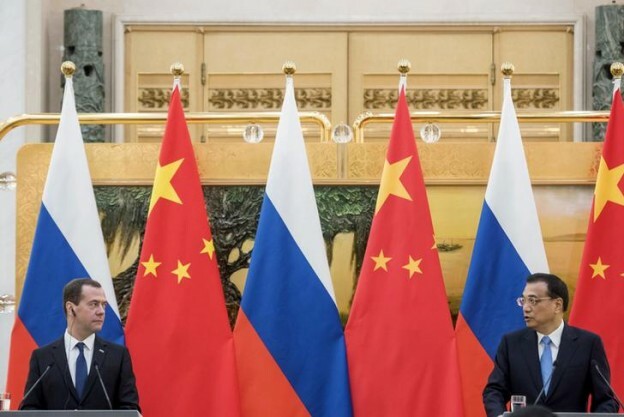 Sino-Russian differences reassure Central Asians by minimizing the dangers of the SCO institutionalizing a China-Russia condominium over them while it provides them with a means to avoid bargaining one-on-one with Moscow or Beijing on some issues. In general, Beijing and Moscow have managed their SCO-related differences, which have been declining in the past year in any case as Russia has relaxed its constraints on cooperating with China. Sino-Russian differences with respect to Eurasia’s institutional architecture have narrowed. Beijing has become more tolerant of the growth of the Moscow-led Eurasian Economic Union (EEU) and Collective Security Treaty Organization (CSTO), while Moscow has recently relaxed constraints on the SCO’s economic activity while accepting its value as a security structure focused on counterterrorism. Yet, Weitz concludes, an isolated Russian leadership, the product of Putin’s grandiose regional aspirations and domestic political imperatives, may have to swallow Chinese primacy in much of Central Asia, which Moscow lacks the means to prevent short of unacceptable military measures. Cooperative rather than conflict scenarios between China and Russia in Central Asia are still more likely in the next few years, he argues.